Living with permanent disability can be difficult no matter what the disability is. It can be hard to get around and into spaces if you are a wheelchair user. It can be tough to get to places and live daily life when you are blind. Fortunately, there are many disability resources and aides that can help make life a little easier and more convenient. These resources, aides, information and financial guidance can help a disabled person live a happy and fulfilled life. There are many independent living resources in New Zealand that can help. Guide dogs are great companions and support to blind people. These dogs go through comprehensive training to provide complete assistance to blind people. They will help their owner get around in public and around their house. 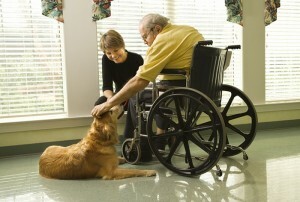 Guide dogs can aid by retrieving items, and he or she will become their best friend in no time. Blind walking sticks are vital pieces of disability equipment and help those who are blind get mobile. They help a person feel in front and on either side so they know when to step up and step down and so on. Guide dogs and walking sticks or blind sensing canes, as they are also known are two crucial resources for any blind person. Thanks to the Internet and new technology there are a variety of ways blind people can read or study. Audio books are a great way to enjoy a good story, listen to a textbook, or learn about something new. Classes can be taken online and education and life long learning can be completed. Voice recognition software is a life-changing device for blind people. It can be used to search the Internet and it will write anything you want by using your voice. When people depend on wheelchairs they need to be able to move around their entire house so they can access everything. Being shut off from certain rooms or even upstairs can have a negative effect on someone’s quality of life. Accessibility to and around kitchens is so important for everyday life and for a person’s enjoyment and pleasure. You can set up a disability friendly kitchen for a loved one in a few steps. When setting up a disability friendly bathroom consideration should be made to mobility, hygiene, independence, privacy and relaxation. Portable wheelchair ramps can help wheelchair users get into public places that don’t have ramps. There are many other disability aides for people living with permanent disability, including window and door systems, signs, grab rails, electrical accessories, and safety flooring. Homes can be altered and built with a disabled person in mind. This provides a person with a home that they can easily move around in, and have the ability to use everything in it. They will have access to their entire home – the bathroom, kitchen, living room, hallways, and bedrooms. Limitations are removed and they can live the lifestyle they deserve to live. For a home to become fully accessible some renovations may need to be done. Hallways in most New Zealand homes are not wide enough for wheelchair users to pass through. A disabled person’s bathroom and / or kitchen may need to be modified or completely changed. For all large-scale jobs consideration will need to be given to temporary disruption and how this will be managed. Creative Living can help and advise on modifications and renovations. No matter what someone’s disability is they can live an easier, more convenient, and more content life with the help of quality disability aides, resources and equipment.